Peterhof, a former Emperor’s residence, the Russian Versailles (https://en.wikipedia.org/wiki/Peterhof_Palace) is located about 30 km from the center of St. Petersburg and being easily reached by rail or auto transport as well as (in the summer days) by a hydrofoil (so-called meteors), which is the most impressive means of transportation. Information on this page has been updated in March 2019. Peterhof (administratively a district of St. Petersburg) is a superb, marvelous and luxurious complex, and it’s difficult to say what its main feature is. Generally accepted that tourist flows are being attracted, first of all, by the fountains, but the parks also serve as magnet for fans of beauty, right and strict geometrical forms and lines. All this together plus the glaring Grand Palace and other buildings compose an astounding landscape which takes you back to the times of European Emperors, royal families, aristocratic dynasty, costume parties and sword duels. The atmosphere makes you wish to be a duke or a baron, not an ordinary tourist in jeans and T-shirt. Here you can spend a whole day enjoying yourself with relaxing, viewing the beautifully adorned parks, lying on the grass or simply sitting on the shores of the Gulf of Finland. Overall, there are six ways to get to Peterhof. Here we list all of them in brief, but we recommend you only two which we further describe in detail. 6) Hydrofoil from the Neva river embankments to the berth of the Lower park in Petergof. About the St. Petersburg subway system read our post here. We advise you to take a mini-bus from Avtovo (the option №1) or a hydrofoil (the option №6). The route from Avtovo is the fastest onland trip, though if you live near the Leninsky prospect or Prospect Veteranov stations, take on there. If you are in any other location in the city, then go to Avtovo. The stop of mini-buses is located just across the street from the only metro exit. As you get out of the metro, you go down the stairs of the underground passage (just 10 meters from the exit), cross the street underground and take the right side to go up. Then you see the buses with signs in Russian Фонтаны, or Fountains in English. Travel time is about 30-35 minutes, fare is 70 rubles. Where to get off. The best way not to miss your stop is to ask a driver to warn you when to take off in advance. Tell him to stop near the fountains (У фонтанов, пожалуйста, or «U fontanov, pozhaluysta»). The drivers got normally used to these requests and sometimes warn the passengers even without being asked for. In any case, you can orientate yourself. 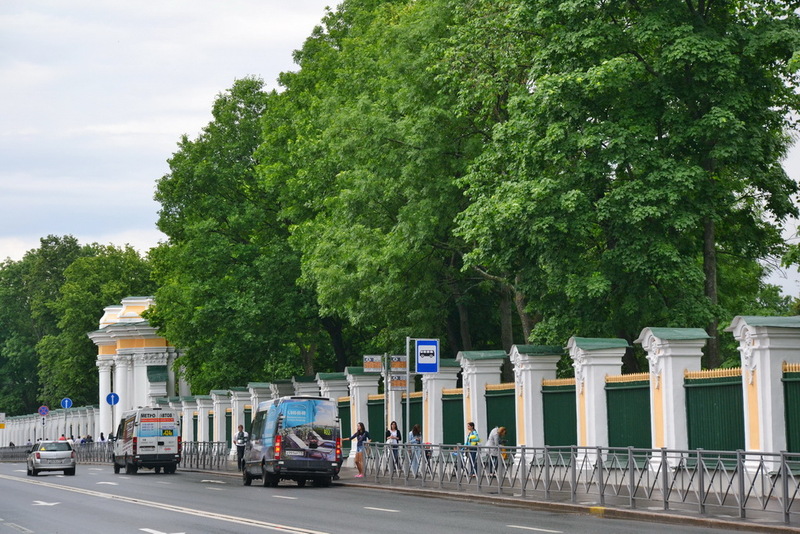 As you are entering Peterhof, look out for a big white and green fence (on the photo below) which will be on the right side. Hydrofoils (https://en.wikipedia.org/wiki/Hydrofoil) to Peterhof depart from two embankments on the Neva river: Dvortsovaya and Admiralteyskaya. They both can be easily found behind the building of the Hermitage; the Admiralteyskaya embankment is on the left of the Dvortsovy bridge and the Dvortsovaya is on the right (see the map below). We recommend you to go to the Dvortsovaya since there operate several carriers you can choose from, while at Admiralteyskaya there is only one. The carriers whose peers are located along the embankment have alike prices and schedules, so you can choose any. Of, course, there are some differences, but they are not that big. — First departure is at 11.00, then every 30-60 minutes. Travel time is 35 minutes. Ticket price in 2018: 850 rubles (when purchasing online 780) for 1 adult. Prices for 2019 will be known in the middle of April. See also our video on YouTube featuring a hydrofoil leaving the city. What’s inside of a hydrofoil. The vessel is divided into three sections, with two viewing platforms among front and middle and respectively middle and rear ones. The platform between the front and middle parts of the vessel is a specially desinged viewing point with platforms on each side of the ship. The platform between the middle and rear parts is just an open-top passage between the two sections with rather high walls, so persons lower than 170 sm with have difficulties in observing the landscape passing by. The choice of seats on the hydrofoils is free, i. e. you take any unoccupied seat you like. Our recommedation here is to try to take seats in the front section which makes it possible to watch the movement of the vessel through the front window, though the other two parts are also good. Though, since the season 2018 some companies converted the first section into a business-class and sell it for 1500 rubles with drinks included. A hydrofoil arrives at the peer of the Lower park, i. e. directly to fountains. Attention: the fare doesn’t include the entrance fee to the Lower park. 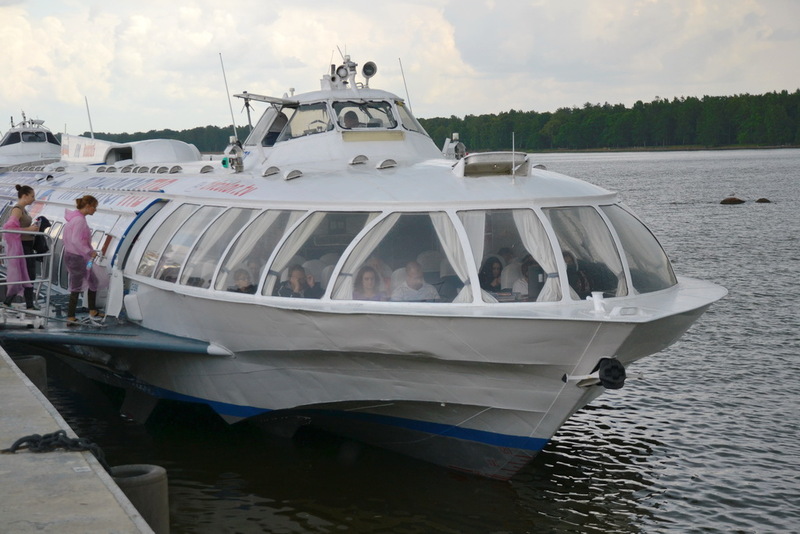 Thus, a visit to Peterhof by a hydrofoil will cost you at least 1750 rubles (without museums). And if you return by a hydrofoil too, it’ll set you back another 850 rubles. The park of Alexandria is a rather big park with several historic buildings and some lovely picturesque views. And that’s all, no fountains, adornments or anything like this. There is a guided excursion around the park on a little train (not sure, they have it in English). Given that your time is likely to be limited, we’d not recommend you to visit it. 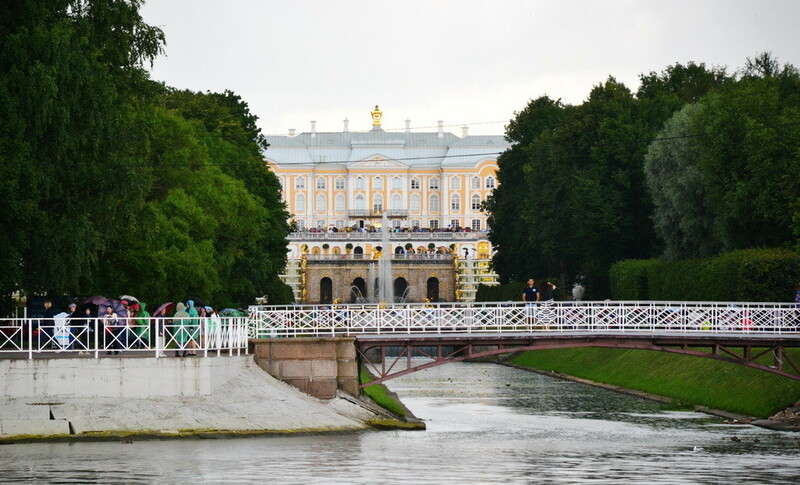 The Upper Garden is free, not very big, just a nice place which separates the Grand Palace with the Lower Park from a town of Peterhof. You’ll cross the Upper Garden if you arrive by onland transport (on the picture above). The Lower Park is the place the iconic photos with the cascade of fountains of which you see in the Internet and postcards and The Grand Palace. The museum, which most tourists in groups inevitably visit, is filled with the amenities and other details from the royal family’s life. 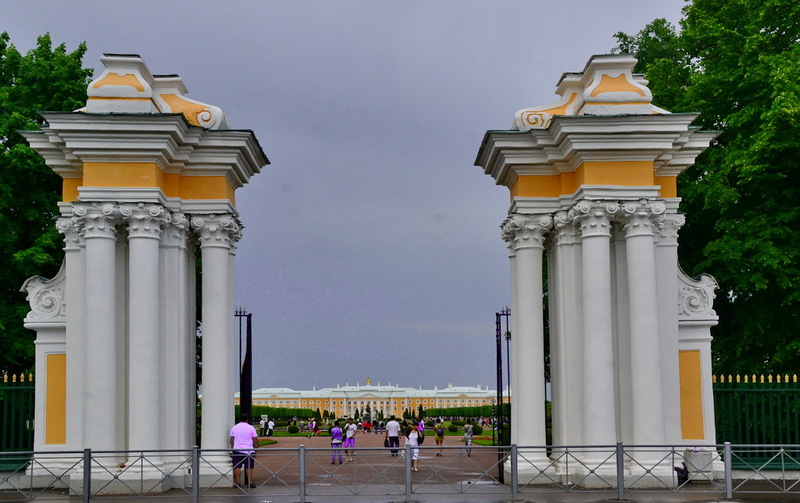 The locals usually prefer avoiding this and other buildings in Peterhof as cannot find a lot of interesting staff there which would be worthwhile spending money and time. However, the locals are understandingly a bit tired of Russian history which they study at school and universities, that’s why they like to spend short and not numerous sunny days in the parks, not in museums instead of delving into the history. Well, it’s totally up to you, whether or not visit the Peterhof’s museums or entirely concentrate yourself on parks and fountains. Overall, Peterhof hosts about 20 museums of different kinds, including the ones displaying royal yachts and playing cards. 1. The Alexandria is open 09.00 — 22.00, cash desk is open till 17.00. Entrance fee is 300 rubles, after entrance is free. 2. The Lower Park is open 09.00 — 21.00 daily. Entrance fee is 900 rubles. 3. The Upper Garden is open daily 08.00 — 21.00. Entrance is free. 4. 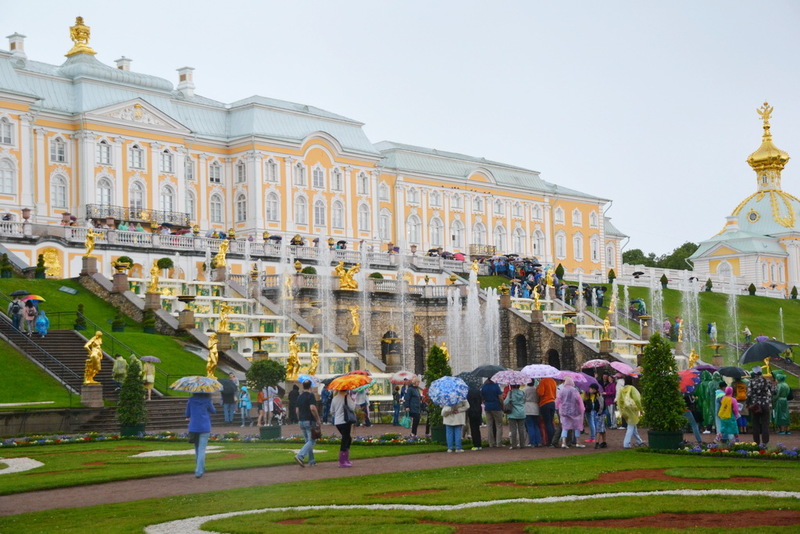 The Peterhof Grand Palace is open 10.30 — 21.00, daily except last Tuesday of the month. Entrance fee is 1000 rubles. Please, note that individual visitors are allowed to enter only in limited hours, the rest of the time the museum serves toursit groups. If you have any questions about St. Petersburg you can leave us a comment. P.S. Beware of artificially inflated prices for food at the Lower Garden of Peterhof!